As many know, the AR18 Armalite design never entered in mass production. 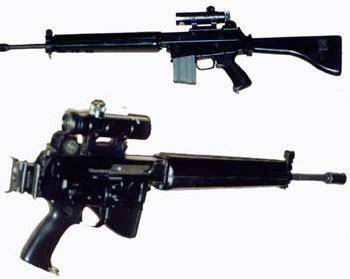 However, not everybody knows that, when Japan decided to modernize their infantry, their government acquired from Armalite the AR18 patent, and gave the manufacturing license to HOWA LTD, their "classic" weapons manufacturer after WW2. The specs of this rifle are the same that the AR18 American rifle, but the Howa AR18 was not mass produced. When it was replaced by the current ordnance Howa 89, hundreds of those rifles fell into the hands of the Japanese Mafia and weapons traffickers. Many of the AR18 rifles used worldwide by terrorists (mostly IRA, but also south African and Japanese terrorists, and Al Qaeda too) are Japan-made exemplars.